There might be a few of you out there who have been using bottled water instead of tap water for the past few months. Sadly the fear of radioactive water far outweighs the pile of discarded plastic bottles. Rather than throwing them all away though at least you can put them to good use. Here are a few ideas and I’d love to know if you have any more! 1. Fridge Tidy: Lie a plastic bottle on it’s side and cut off the top face. You can put plastic electrical tape round the edges if they’re a bit sharp. I was going to take a photo of mine but then looked in the fridge and thought better of it! It’s just the right length to match the depth of our fridge. 2. Bird Feeder. This was fun to make. It took a while for the birds to cotton on to how to use it but they like it now. Get a plastic bottle, drill two holes in the bottle to run a pice of doweling through. Drill one more hole about an inch or two above this for the birds to peck out the seed. Hang from a handy tree. Make sure the cap is on to keep out the rain! 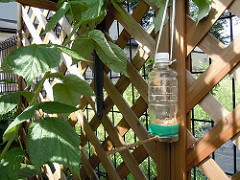 There are lots of sites with more detailed instructions if you google ‘bottle bird feeder’. 3. 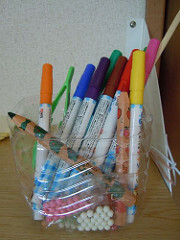 Desk Tidy: Cut off the top! Easy. Decorate with electrical tape and stickers if you like. 4. Seed Trays / Plant Pots: Cut off the top and stab drainage holes in the bottom. You can vary the depth depending on the type of seed you’re planting. One word of warning is you don’t want it in direct sunlight or the roots could burn. Paint black or cover with black paper or plastic if you want to protect the roots. 5. 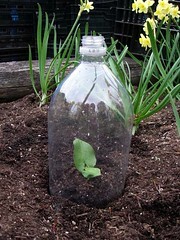 Watering Can: Drill holes in the cap and use for watering flower/seedlings. 6. 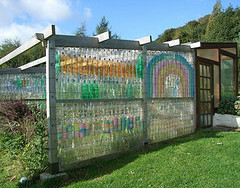 Greenhouse / Cloche: If you have *a lot* of plastic bottles you could make a greenhouse by stacking them all up within a wooden frame. If you don’t have quite that many just cut off the bottom, take off the top and place over a seedling or vulnerable plant when the weather starts to turn cold.